If you’ve been following this blog for a while you may have realized that I’m deeply interested in Japanese culture and arts. Even so, I generally don’t consciously seek out Japan focused activities but they do have a tendency to jump out at me. Over the weekend I realized that there are a number of exhibitions and seminars going on at the moment that it would be worth capturing them for anyone else who’s interested. The headliner of these events has to be the Hokusai exhibition at the MFA in Boston that runs until August 9. 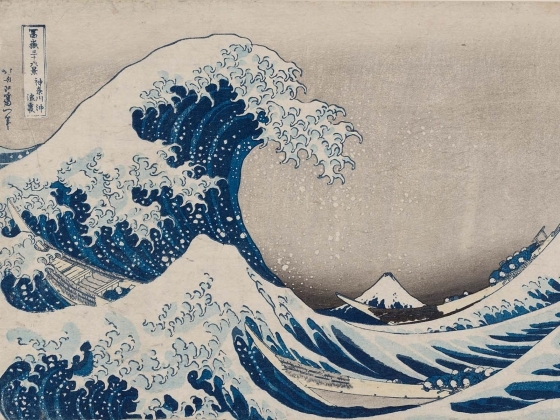 Even before I started learning more about Japanese arts I recognized ‘The Wave’ shown above. This exhibition promises to be a comprehensive look at Hokusai’s work from his 20s through his 80s. Check out the MFA blurb on the exhibition here. There is a corresponding exhibition catalog that would be worth a look even if you’re not able to get to the exhibition. Also at the MFA is the exhibition ‘In the Wake’ which presents the photographic response of 17 Japanese photographers to the Great East Japan Earthquake and the resulting enormous wave of water swept through towns in the Tōhoku (Northeast) region destroying virtually everything in its path including the Fukushima nuclear power plant. The exhibition catalog can be found here. Finally at the MFA, ‘Playing with Paper’ in gallery 278A looks like it will be fun. This is an exhibition of woodblock ‘toy prints’ that shows how the 19 th century Japanese toys and games were enjoyed. In New York of Friday and Saturday of this week there is a symposium: ‘Shashin Symposium: Photography from Japan’ that looks to have a good program. Of course the popup bookshop caught my eye – it would be worth going just to get an advance copy of Yoshihiko Ueda’s retrospective photo book “A Life With Camera”. Also in New York is the exhibition “Life of Cats: Selections from the Hiraki Ukiyo-e Collection” which runs until June 7.